Preface 1. Coal Preparation. Unit operations. Coarse coal versus fine coal circuits. Seam-to-Steam strategy. Role of coal surface properties in fine coal processing. References. 2. Coal Characteristics Related to Coal Preparation. Introduction. Coal classification. Coal petrography. Inorganic matter in coal. Sulfur in coal. Liberation. References. 3. Coal Surface Properties. Introduction. Coal surface wettability. Contact angles. Electrical charge at coal/water interface. Coal porosity and moisture. Surface components hypothesis. Patchwork assembly model of coal surface. Effect of coal rank on floatability. Floatability of coal macerals. Experimental methods of characterizing coal wettability. Contact angle measurements on flat surfaces. Contact angle measurements on granular material. References. 4. Coal Floatability. Introduction. Floatability. Equipment. Release analysis. The tree technique. The advanced flotation washability (AWF) procedure. The use of the floatability curves. References. 5. Reagents. Introduction. Reagents. Collectors. Frothers. Promoters. Coal and pyrite depressants. Inorganic modifiers. Reagents' mode of action. Water-insoluble oily collectors. Introduction. Emulsion flotation. Frothers - water-soluble surface active agents. Joint use of oily collectors and frothers. Promoters. Concentrated inorganic salt solutions. Depressants. Coal depression. Pyrite depression. References. 6. Flotation Technology. Introduction. Characteristics of coal. Characteristics of pulp. The use of reagents under industrial conditions. Desulfurizing flotation. Flocculants in coal preparation. Salt flotation. References. 7. Fine Coal Multi-Unit Processing Circuits. Flotation and gravity methods in fine coal processing. Flotation circuits for difficult-to-float coals. Advanced coal flotation circuits. References. 8. Flotation Machines. Introduction. Collection zone kinetics. Effect of froth on flotation kinetics. Coal flotation vs. mineral flotation. Classification of flotation machines. Mechanical flotation machines. Pneumatic flotation cells. Contactor/separator machines. Froth separation. References. 9. Particle Size Enlargement. Introduction. Oil agglomeration. Flocculation. Coagulation. Bridging flocculation. Hydrophobic agglomeration with totally hydrophobic flocculants. Pelletization. Briquetting. References. 10. Fine Coal Utilization. Utilization of thermal coals and metallurgical coals. Fine coal handleability. Spontaneous combustion of coal. Coal-Water slurries. Viscosity of suspensions. Effect of coal particle size distribution on rheology of CWS. Effect of coal surface properties on rheology of CWS. Additives in the preparation of CWS. CWS from low rank coals. Effect of coal beneficiation on CWS. References. Appendix. Index. To stay profitable while complying with environmental regulations requires that the coal industry not only improve fine coal recovery but also finds better ways for its utilization. 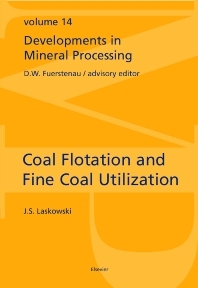 This is the first monograph on the processing of fine coal which recognizes that all unit operations that handle fine coal depend on coal surface properties, and which in one single volume provides a comprehensive introduction to coal surface chemistry, using it rigorously in treating coal flotation fundamentals and engineering, fine coal manipulation, pelletization and briquetting, and coal-water slurries. Readers involved in mineral processing, chemical engineering, mining and metallurgical engineering; technical personnel working for reagent suppliers; and scientists researching the field of coal surface chemistry, flotation and fine coal utilization will find this volume of great interest.